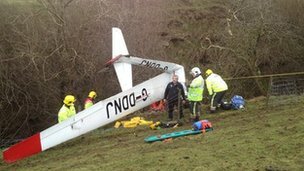 A 74-year-old pilot was rescued after crashing his glider in the Derbyshire Peak District. Emergency services including air ambulance crews and mountain rescue teams were called to the village of Abney at about 13:00 GMT on Tuesday. A mountain rescue spokesman said the pilot, from Stockport, had stalled his glider and crashed into a tree. He was taken by air ambulance to hospital for treatment to injuries to his legs. Derbyshire Police said the pilot remained in hospital in a stable condition. Hydraulic cutting gear was used to free the 74-year-old from the wreckage of his aircraft. Dr Steve Rowe, of Edale Mountain Rescue Team, said: "The job went very well, despite the difficulties of a tricky extrication, and all the organisations at the scene worked together to achieve a good outcome for the patient."